Please consider our important information before voting on strengthening regulations to address vaccine hesitancy! Recent measles cases across Europe have led to a call for increased vaccination coverage, but measles vaccines is not always the answer. It can be seen that the majority of measles deaths in Romania may actually be due to other conditions, therefore serious questions has to be asked about healthcare and mortality. By focusing only on vaccination, Europe is missing vital opportunities to improve healthcare and reduce mortality. Vaccine hesitancy – could lack of transparency have anything to do with it? Read our document addressing the long history of fraud and corruption by the Pharmaceutical industry, and the lack of transparency when it comes to research and science. Vaccine safety – what if we do not know enough about the long term consequences of vaccinating all our children? It is of great importance that MEPs are fully informed of the higher risk for autoimmune disease in vaccinated children, a life-long debilitating condition. The financial costs alone for those conditions are looking to exceed 80 billion euros. Read our important document on vaccine safety. A scientific overview of problematic issues, and the lack of honest, accurate and reliable data. 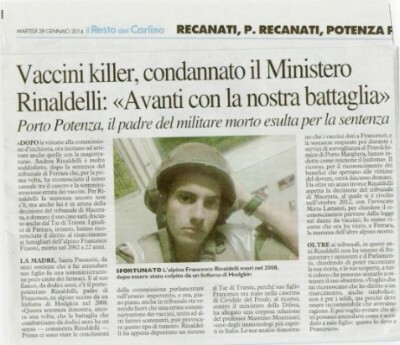 Italian Military experience autoimmune diseases when given many vaccines at one time. There has been breaking new science from Italy where a statistically significant association between multiple vaccines and autoimmune disease in the Italian Military was found. Just recently the Commission of Investigation from the Italian Parliament (‘Uranium’) on death and serious illnesses among military personnel assigned to missions abroad, advised that the Italian Military not receive more than 5 vaccines at one time and that they undergo a pre-vaccine test for susceptibility. What about our children? The EFVV’s human rights petition for informed consent has been translated into 13 languages and now signed by over 170 000 concerned citizens. Do you agree that in light of all the above mentioned uncertainties, and the potential long-term effect on European’s health, and the substantial financial and social impact on our society, further discussions around compulsory vaccination and vaccine hesitancy must be considered?